In the last couple of months I have tried to “up the ante” with training load to further increase my fitness and start to enjoy more the Aquathlon/Duathon/Triathlon local competitions I compete in with other people my age. Physical activity is important to maintain/improve fitness but also to help with our mental wellbeing (see the evidence here). For me it is also a way to keep up with my super active family and a social opportunity to meet other people. But of course, to do it safely I need to train. Training is done progressively, within reasons and adequate to my fitness levels, and most of all trying to get some routine times to have consistency. But despite all this I have fallen victim of the classic party pooper for anybody involved in running activities after a certain age. I am in this with many other colleagues/friends my age. All former athletes at some level, very active and all recently affected like me by the “old man calf syndrome” or as we jokingly describe it “being shot by the invisible sniper while running“. Calf strains are in fact common. The most common calf injury is a tear of the medial gastrocnemius muscle (Tennis Leg) but other structures including the lateral gastrocnemius, and soleus also may be the cause of muscular pain experienced suddenly while running. In my case, I seem to favour the soleus, but in general, I see many like me struggling with this. If you want to know more about the anatomical structures, make sure you read this very recent amazing paper from Bosterlee et al. 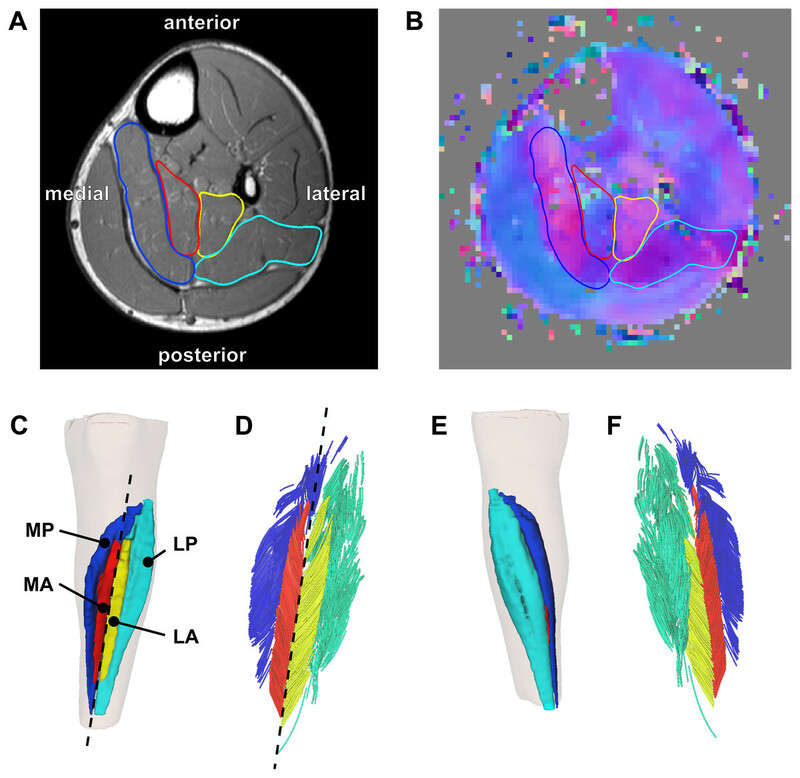 which used imaging to do a 3D reconstruction the soleus (see image below). And if you want to read more about the gastrocnemius structure, read this really good paper here. In the literature to date, there is an absence of definitive data relating to risk factors for calf muscle strain injuries. Despite the fact that is really common, there seems to be very few studies on this. A recent systematic review does suggest that strong evidence exists for an association between increased age and future calf strain as well as previous injuries and recurrence. So, there it is, you get older you increase risk, you get your first “pop” and you are going to get more. However, the systematic review clearly indicated that there is a lack of well controlled studies on this and the causes still need to be worked out (albeit we can all agree that for sure it is multifactorial). Many things should be looked at: 1) blood flow to the calf muscles might be compromised with age, 2) neuromuscular function in the whole lower limb is negatively affected by age, 3) tendons are affected by age and activity and are still mechanosensitive in older adults, 4) tendon elasticity is affected by age and activity. Despite the fact that activity helps reducing the negative effects of ageing on musculoskeletal structures, we are often bound to many hours of “desk work” which has major negative influences on blood flow and neuromuscular function of the lower leg. Therefore, there is a plethora of things which can cause the injury to occur in the first place and then re-occurr. While research is needed to understand the cause and possibly the best way to reduce the chances of occurrence (albeit it is common advice to strengthen the muscles, increase tendon elasticity and neuromuscular control paired with an adequate pair of running shoes), some advice exists on recovery modalities. The usual conservative treatment initially should consists of rest, ice, compression, elevation (RICE). Non Steroidal Anti Inflammatory Drugs can be utilized, though this is controversial. Patients can utilize cryotherapy, massage, passive range of motion, and progressive exercise to reduce the symptoms. In general, Grade I injuries, which present with partial tearing with no loss of muscle integrity, heal in a few days to a few weeks. Grade II muscle strains (10–50% of muscle disruption with loss of strength) need one to 6 weeks before the patient can return to training. Grade III injuries could take up to six months for return to activity as they involve loss of more than 50% of muscle integrity and have noticeable defects. Re-injury is frustrating and common, and therefore a cautious approach to return to training and competition should be used. For sure, there is no magic pill or magic bandage which can “fix” you, unless you are after some placebo effect. So here it is for research groups interested in soft tissue injuries in ageing athletes: there is a lot which needs to be done to understand more about the aetiology of calf strains, its prevention and rehabilitation. We need your help to keep our competitive souls going and avoid the disappointment of limping to the finish line.